A magnet is an object or a device that gives off an external magnetic field. Basically, it applies a force over a distance on other magnets, electrical currents, beams of charge, circuits, or magnetic materials. Magnetism can even be caused by electrical currents. While you might think of metal magnets such as the ones you use in class, there are many different types of magnetic materials. Iron (Fe) is an easy material to use. Other elements such as neodymium (Nd) and samarium (Sm) are also used in magnets. Neodymium magnets are some of the strongest on Earth. There are many different types of magnets. Permanent magnets never lose their magnetism. There are materials in the world that are called ferromagnetic. Those materials are able to create and hold a specific alignment of their atoms. Since many atoms have a magnetic moment (tiny magnetic field), all of the moments can add up to create a magnet. Scientists use the word hysteresis to describe the way the atoms stay aligned. Most of the magnets you see around you are man-made. Since they weren't originally magnetic, they lose their magnetic characteristics over time. Dropping them, for example, weakens their magnetism; as does heating them, or hammering on them, etc. There are also air-core magnets. 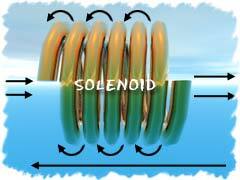 Air-core magnets are created by current flowing through a wire. That current produces the magnetic field. You create an air-core magnet by wrapping miles of wire around in a doughnut shape (toroid). When you send current through the wire, a magnetic field is created inside of the doughnut. Scientists sometimes use air-core magnets to study fusion reactions. Electromagnets are different because they have a ferromagnetic material (usually iron or steel) located inside of the coils of wire. The core isn't air, it is something that aids in producing magnetic effects, so electromagnets are typically stronger than a comparable air-core magnet. Air-core and electromagnets can be turned on and off. They both depend on currents of electricity to give them magnetic characteristics. Not only can they be turned on and off, but they can also be made much stronger than ordinary magnets. You might see an electromagnet at work in a junkyard lifting old cars off the ground.